In press releases published yesterday, September 16, 2018, Dr. Saeeb Erekat said that the Sabra and Shatila Massacre is a reminder of Israel’s barbaric crimes. Erekat added, according to the PNN, that the massacre of Sabra and Shatila is not only a reminder of the barbaric crimes committed against the Palestinian people. but, overall, it highlights the effects of the impunity granted to Israel and its officials by the international community. The main responsibility of the massacre fell on Ariel Sharon, who was also responsible for many other war crimes committed against the people of Palestine. Sharon died without being held accountable, Erekat said. Erekat ended his statement by saying that Israel continues to threaten the very existence of the Palestinian people on their land with evictions, home demolitions, the siege of Gaza, forcible transfer in occupied East Jerusalem, Khan Al-Ahmar, on the eastern gateway to Jerusalem, and elsewhere in occupied Palestine. predominantly Christian Lebanese right-wing party in the Sabra neighborhood and the adjacent Shatila refugee camp in Beirut, Lebanon. From approximately 18:00, on 16 September, to 08:00, on 18 September, 1982, a widespread massacre was carried out by the militia, under the eyes of their Israeli allies. The Phalanges, allies to the Israeli army, were ordered by to clear out Palestine Liberation Organization (PLO) fighters from Sabra and Shatila, as part of Israeli maneuvering into West Beirut. 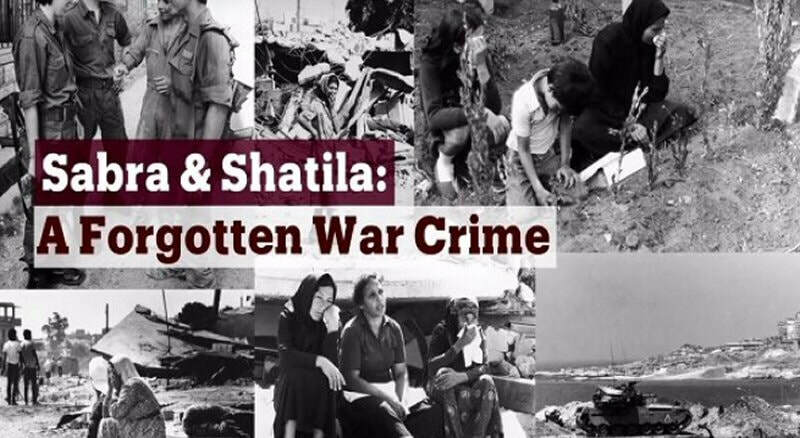 Israeli forces received reports of some of the Phalangist atrocities in Sabra and Shatila, but did nothing to stop them. In June of 1982, the Israeli army had invaded Lebanon with the intention of rooting out the PLO. By mid-1982, under the supervision of the Multinational Force, the PLO withdrew from Lebanon following weeks of battles in West Beirut, and shortly before the massacre took place. Various forces — Israeli, Phalangist and, possibly, also the South Lebanon Army (SLA) — were in the vicinity of Sabra and Shatila at the time of the slaughter, taking advantage of the fact that the Multinational Force had removed barracks and mines that had encircled Beirut’s predominantly Muslim neighborhoods and kept the Israelis at bay, during the Beirut siege. The Israeli advance over West Beirut in the wake of the PLO withdrawal, which enabled the Phalangist raid, was considered a violation of the ceasefire agreement between the various forces. The Israeli army surrounded Sabra and Shatila and stationed troops at the exits of the area to prevent camp residents from leaving and, at the Phalangists’ request, fired illuminating flares at night. Hamas on Saturday, on the 36th anniversary of Sabra and Shatila massacre, called for prosecuting Israeli leaders responsible for the crime at international courts. In a statement released by Hamas's Office for Refugees Affairs, the movement said that Sabra and Shatila massacre is part of an endless series of atrocities committed by the Israeli occupation against Palestinians. Hamas affirmed that the heinous massacre will never be forgotten with the passing of time, and that the international community has responsibility for bringing Israeli leaders to international courts. Hamas called on the Lebanese government to show solidarity with Palestinian refugees in Lebanon by granting them civil, economic, and social rights. It also urged friends of Palestinian people all over the world to support them against US attack on the refugees issue by cutting aid to UNRWA. Saturday marks the 36th anniversary of Sabra and Shatila massacre at the hands of the Israeli occupation army, a militia close to Lebanon's Kataeb party and the South Lebanon Army. Despite the passing of 36 years since the Sabra and Shatila Massacre, it is still deeply rooted in the minds of the older generation that passed the story of what happened to to their children to tell them that their ancestors, fathers, mothers and brothers were massacred by the Israeli forces and the Lebanese militias in one of the worst massacres in the Palestinian history. The massacre left doctors and journalists broken after they inspected what the Israeli-sponsored massacres against the poorest refugee camp in Lebanon Shatila, and the Lebanese neighborhood of Sabra, which took place just two days after the assassination of Lebanese President-elect Bashir Jemayel. He was the leader of the right-wing militias that collaborated with the Israeli forces which occupied southern Lebanon in 1982. On the night of ‘Black Thursday,’ as the Palestinians and the Lebanese call it, the late Israeli Prime Minister Ariel Sharon (then war minister) ordered the encirclement of Sabra and Shatila camps in preparation for committing one of the most heinous massacres in modern history. As the night of September 16, 1982 drew, the Israeli occupation forces and Isolationist Groups: (the Lebanese Phalangist and the Southern Lebanese Army), began advancing through the southwestern alleyways of the camp facing Acre Hospital, and spread all over its streets, taking full control of it. For three days, the Isolationist Groups and Israeli soldiers carried out horrific massacres against the unarmed inhabitants of the camp, making it one of the ugliest massacres perpetrated throughout human history, according to an eyewitness. 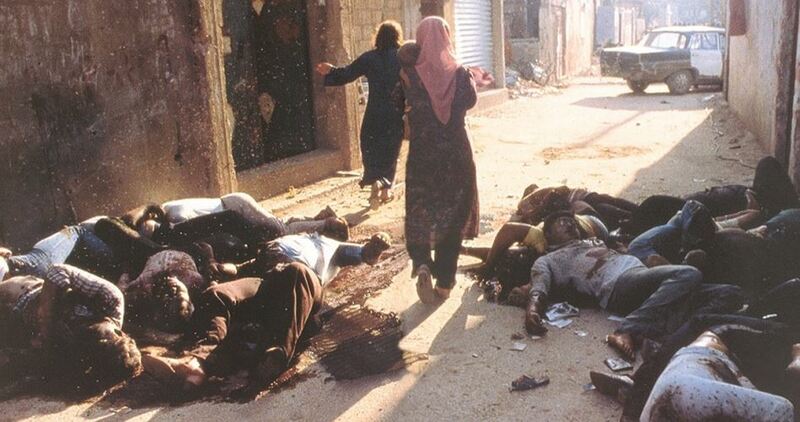 After the Sabra and Shatila massacre, the Israeli forces allowed doctors and media in. They were shocked by what happened and what they saw of ugly scenes of cut off bellies and slaughtered necks and dead bodies in the streets. 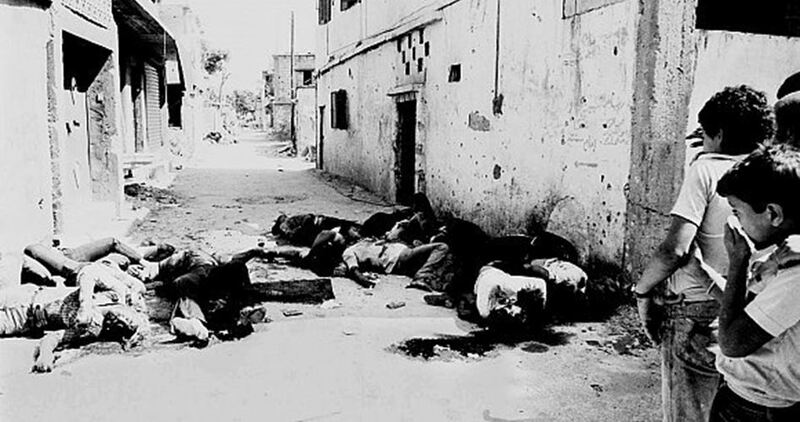 Figures on the number of victims of the heinous massacre vary, but estimates suggest that between 750 and 3,500 men, women and children, were killed in less than 48 hours on September 16 and 17, 1982, out of the 20,000 inhabitants of Sabra and Shatila at the time. The whole world was shocked by the massacre; the Israeli government tried to comply with pressures and formed a commission of inquiry. Sharon was charged with responsibility for the massacre, but he denied its occurrence. He rejected the accusations and resigned from his position as war minister and returned years later to take the position of Israel’s Prime Minister! In addition to these victims, there were hundreds of missing persons, and others whose bodies were found on the roads from Beirut to the south, which were occupied by Israel. The Israelis kidnapped several hundred Palestinian refugees who were transported in trucks to unknown destinations.